These days, teams of all shapes and sizes -- from NASA to charity: water -- are using the real-time messaging app Slack as a tool to better collaborate with their colleagues and better communicate with their customers. Over the past few years, however, Slack has become robust enough to work directly with the other platforms your business knows and loves -- thanks to many fun and useful integrations folks have built on top of it. From polling your teammates, to tracking bugs, to fielding questions from potential customers, there's more to Slack than meets the eye. The Slack App Directory is the best place to find apps and integrations you can connect to Slack. But with so many available, finding the best of the best can seem like a bit of a crapshoot. That's why we created the list below of 14 of the best apps and integrations on Slack today. Check 'em out, and consider implementing the ones that make sense for your team. Before we get into the apps and integrations themselves, let's quickly make sure we all know how to add an app or integration to our Slack teams. You can add an app or integration to Slack either through the Slack App Directory or by clicking on an individual app's "Add to Slack" button. To add via the App Directory: Either click here, or open Slack and click your team name at the top left-hand corner, and choose "Apps & integrations." If you're having trouble adding apps and integrations to your team's Slack, it may be because you don't have the proper permissions. Team owners and administrators can limit who can add apps to a Slack team, so talk to one of them if you have questions. 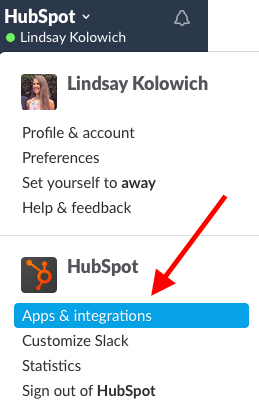 Note: Want to see which apps and integrations your team is currently using? Check out the Slack App Directory and click "Configure" at the top right. You can filter this list by app name, who added it, or the permissions it uses. Poll people easily right within Slack. Simple Poll is a polling app that's super easy to use. It's easy to create a poll, for your team members to respond, and to figure out which answer got the most votes. Once you add the app, all it takes to poll your team is a simple slash command. Type /poll "Poll question?" "Option1" "Option2" "Option3" and a poll will be created for you and sent out by a bot, without any specific team member's name linked to it. /poll "where should we have lunch?" "chipotle" "2nd street cafe" "that new hummus place"
By default, it'll add the "1," "2," and "3" icons to the bottom of the post so folks can easily respond by clicking on the number emoji that corresponds with their preference, instead of having to fish for it in the "Reactions" option. Ask questions about marketing, sales, and growth. Here's a Slack app from the desk of HubSpot Founder & CTO Dharmesh Shah. 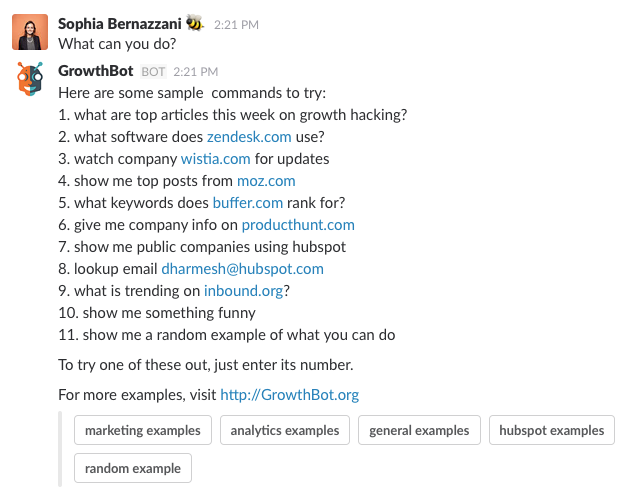 Slack users who work in marketing, sales, and other growth-focused organizations can ask GrowthBot simple questions about different systems, analytics, and trends. Start a private message by chatting @growthbot. Use Slack's "slash" command to chat with GrowthBot by typing /growthbot. Manage your sales pipeline in team conversations. 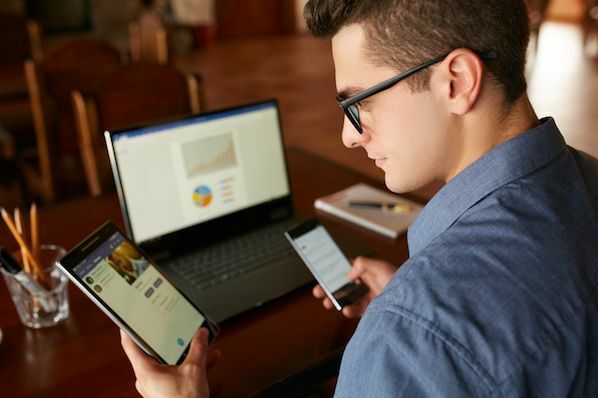 Troops is a task manager specifically for salespeople, allowing every member of a sales team to collaborate, manage, and report on their sales pipeline. 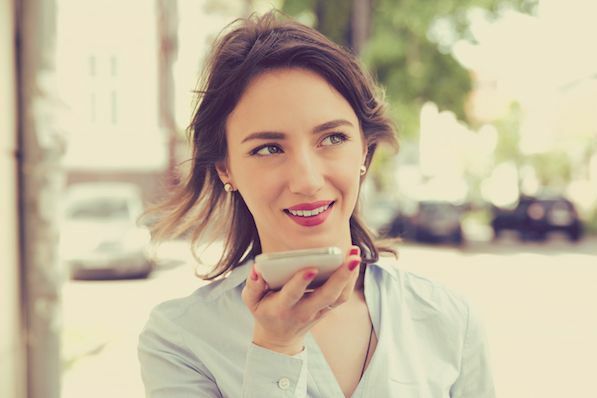 The tool's most unique feature is its artificial intelligence (AI) chatbot, which notifies the salesperson as tasks approach or need to be changed. 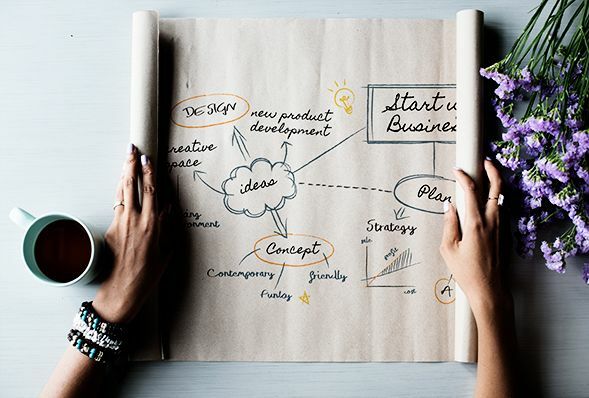 Because the sales process moves so fast, it can be difficult to make sure every tool the sales staff is using is kept updated with new leads, calls, deals, and close dates. Troops' integration with Slack allows sales staff to manage their pipeline while collaborating with the rest of their team at the same time. 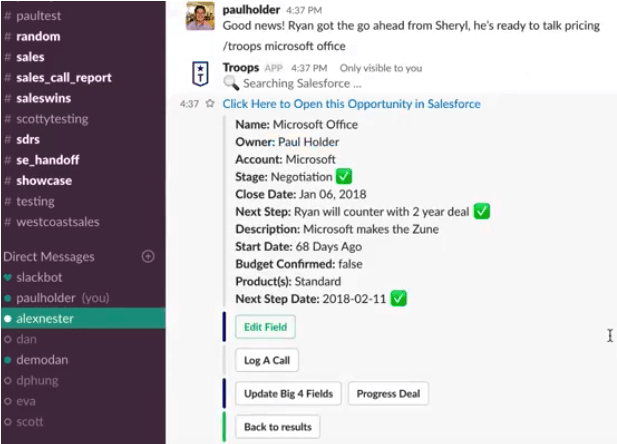 By receiving Troops' chat-based alerts within Slack -- and creating Troops tasks in Slack conversations -- salespeople can make sure the whole team is on the same page at all times. Send annotated screenshots directly to Slack. If your desktop is anything like mine used to be, it's flooded with screenshots that you take -- which are tedious to look through and move later. But the process of saving screenshots, annotating them, and sharing them with your team doesn't have to be so manual. Enter Marker, an incredibly useful Chrome extension for folks who regularly find themselves sharing screenshots with teammates on Slack. (It also integrates with Trello, GitHub, and other apps.) Once you install the extension and the app, you can capture your whole screen or a selection, annotate it, and send it to a person or channel on Slack. On top of letting you annotate the screenshot with arrows, text, and emojis, the app automatically attaches the URL of the page where the screenshot was taken and sends it along with the picture. Although the main use case the folks at Marker talk about is bug-tracking, you can use it for a lot more than that: reporting small typos, capturing parts of interesting articles, sharing ideas for where to go to lunch, and so on. Add fun, random GIFs to your conversations. Ever wanted to share an emotion or a reaction that would be better described with images rather than words? Enter Giphy. In Giphy's Slack app, all you have to do is type in the slash command /giphy and any phrase -- from "awesome" to "bagels for days" to "WHAT IS HAPPENING." (Yes, they have GIFs for pretty much everything.) Then, the app will use that phrase to call in a random GIF from their gigantic library of GIFs, and it'll post it along with the command. 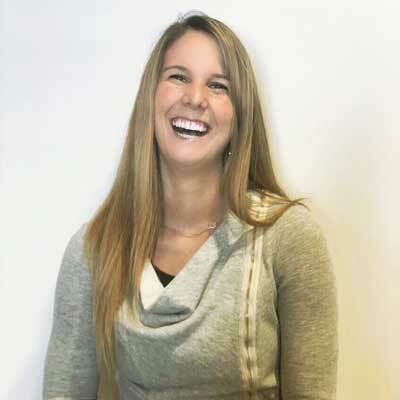 Use it to express yourself, to lighten things up, and to set a maturity rating for your team. What's fun -- and sometimes weird -- about the Giphy app is that you never quite know what you're going to get. You could type in /giphy need pizza ten times and get ten different GIFs. So if you're looking for accuracy, here's a pro tip: Use the /giphy command a few times in direct messages to Slackbot, then save and share the GIF you like best. Discover great web content curated by Digg. 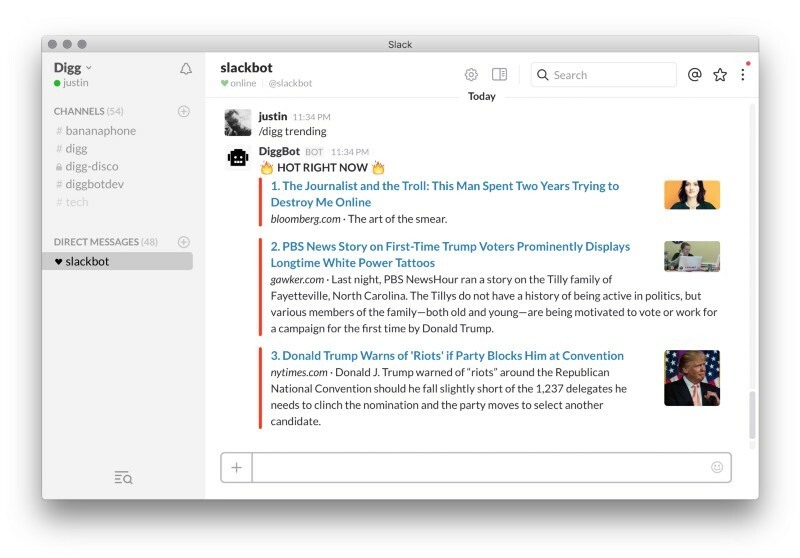 If you're looking for a way to discover new content like news and video right in Slack, Diggbot is the best app for it. Every day, Digg aggregates 10 million RSS feeds from virtually all publishers, and collects 200 million tweets daily -- 40 million of which include links. Their algorithms process all of these links in real time (about 7.5 million per day), and then human editors come in and cherry-pick the best stories and videos. Diggbot sits on top of all this data and gives you the resulting stories and videos right within Slack. They've done it in a way that feels natural and conversational. You can use Diggbot to search for the latest news on any topic or from any publisher, get trending news alerts, and get the twice-daily Digg Edition right to your Slack channel. /digg: Gives you a cool, fresh link. Simple. /digg (keyword): Lets you search content by keyword. /digg (domain): Lets you see top trending stories for a domain (e.g., “/digg nytimes.com”). /digg trending: Gives you a list of stories that are trending on the internet. /digg fun: Gives you something fun. Organize and share important knowledge in an internal wiki right within Slack. When you have a small team, it's easy to keep in touch with one another by way of in-person chats, quick one-on-one Slack conversations, and so on. But the larger your team gets, the harder it is to keep everyone in the loop. That's where having an internal wiki for folks to document updates -- everything from new ideas to experiments you ran to important team updates -- can be so important to both keeping everyone informed and scaling the culture of your team. 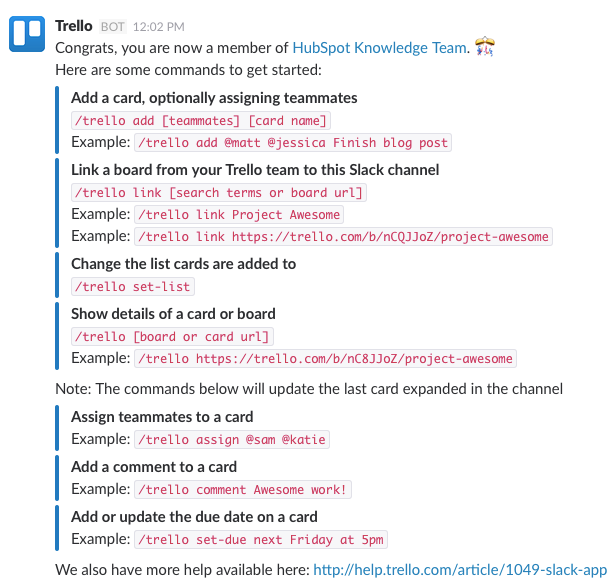 If your team is already on Slack, why not have your internal wiki right within that app? 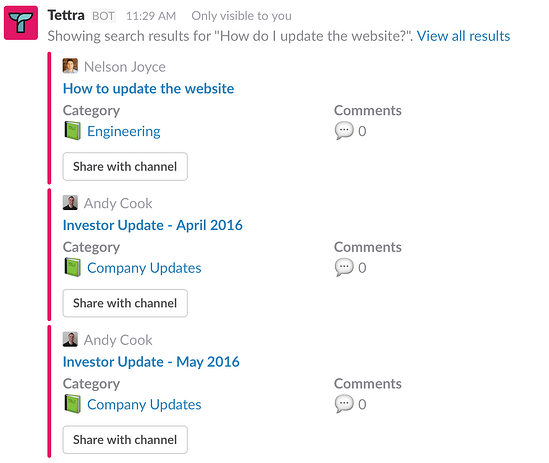 Tetra is an internal wiki for teams that use Slack. It's a simple team collaboration tool with a great design that can help your team organize and share important knowledge in one place. You can even search the wiki right from Slack if you want to. Share Google Drive files in Slack, and find them easily later. A lot of people use Google Drive to store files securely online, access them from anywhere, and collaborate with others. If you're one of these people, the Google Drive app is a great way to make sharing files among teammates a lot easier. Easily start a Google+ Hangout with team members in your Slack channels. That command will provide you with a link that you can use to quickly hop on a video call. Get analytics updates for specific metrics on-demand. If you use analytics tools like Google Analytics, New Relic, or Mixpanel, then Statsbot is a great app to add to Slack. Quite simply, Statsbot integrates with these tools and monitors your metrics. Then, whenever you want an analytics update, all you have to do is ask Statsbot for the number and you'll get it instantaneously. This saves you the time of opening up a new browser window, signing in to your analytics application, and searching for that number manually. Plus, you can ask for an unlimited number of data requests, reports, and alerts and the app stays free. In the example below, you'll see the user opened up a conversation (either with his or her team, or with Slackbot) and @-mentioned Statsbot. He typed in: @Statsbot: new users this week. Check out the conversation that follows to uncover some of the bot's capabilities. Set work and break timers to boost productivity. Ever heard of the Pomodoro Technique? It's a productivity technique where you work for 25 minutes, followed by a five-minute break. This is more effective than forcing yourself to commit to long periods of uninterrupted work, which can often have an adverse effect on your productivity. When you add the Tomatobot app to Slack, you'll be adding a few useful tools that'll track your work using the Pomodoro Technique. For example, you can chat the Slackbot and tell it when you start working with the simple slash command /startwork, and you'll receive a message when it's time to take a break. Use the command /completed to indicate when you're done with a task. Test your website for common bugs. Normally, you'd go to their website, plug in the URL of your website, and click "Test now" -- but if you use Slack anyway, why not trigger a test using the free integration? With the Monkey Test It app installed, anyone in your organization can test your website for common bugs using the simple slash command /monkeytest (http://www.your-website.com). From there, the results will show up right in your chat window, no code required. Plan group lunch outings without spamming your channels. Work on your team's collaborative to-do list without changing tabs. Find a Slack app integrations that would suit your company? Tell your marketing or customer service team. There's no better time to make your business more accessible to the people trying to reach you.